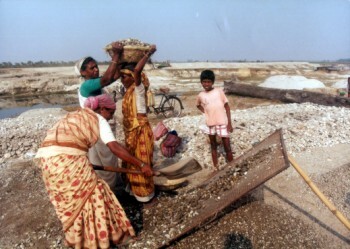 The transition to democracy in Bangladesh after the removal of an authoritarian regime through a popular movement started in December 1990. A Joint Declaration, a consensus document subscribed to by the three major political alliances, had been made on 19 November, 1990, setting out their common goals. It had contained the following commitments: replacement of a "rubber stamp" parliament by one which was "sovereign", establishment of an accountable government, restoration of the rule of law and the independence of judiciary, repeal of "black laws" i.e., laws inconsistent with fundamental rights, upholding the freedom of the press and entrusting radio and television to an autonomous, independent agency. The rule of law was a priority objective, since terrorism and extortion practiced by armed gangs of mastans (thugs), had been one of the obnoxious features of the old order. It had disrupted academic life in the universities where students were already suffering from a three-year backlog of examinations. Armed thugs were infiltrated into the universities to divide students and to promote a kind of tribal conflict among them so as to pre-empt a united students' movement for restoration of democracy. The civil administration, working for years under an over-centralised authoritarian system, had become a compliant instrument for implementing arbitrary decisions. With the restoration of democracy, it was expected that there would be more openness and transparency in government, more active participation of the people in the making of policies and taking of decisions through an active process of consultation. It was also expected that radio and television would be entrusted to an autonomous corporation. Thirteen years and three elections later, the current situation presents a worrying picture for all those who had wanted to see democracy beginning to deliver. The law and order situation has continued to deteriorate. This was the result of the continued failure in law enforcement due to partisan procedures reminiscent of the old order. The first principle of the rule of law, namely that no one is above the law and that all persons are equal in the eye of the law, had been disregarded. Armed thugs apparently under the protection of the ruling party seemed to enjoy immunity as they terrorised their opponents in the campuses and outside. The law-enforcing agencies, which had been accustomed to such partisan application of law, fell easily into line and continued to look the other way as campus violence resulted in the closure of universities, Rajshahi being the latest. The shoot out there was between the "student" organizations of political parties in the ruling alliance. The principal political parties in Parliament continued to pursue short term advantages. It had been expected that Parliament would emerge as a strong institution where the Government and opposition could work effectively together to deal with critical national issues. The national issues which called for such a bi-partisan national approach included violence in the campuses, "sick" industries, the vacuum created by the absence of elected local government at administrative tires below the national level, and educational and administrative reforms starting to optimise benefits from development of natural resources such as oil and gas, as also key foreign policy areas such as water-sharing within a framework of long term regional cooperation. Unfortunately, the intensely adversarial format in which parliamentary politics was conducted led to increasing confrontation within the Parliament and outside. There is increasing realisation that each political party must practice democracy within the party. Every party worker in Bangladesh would want to know from their party leaders in parliament why they attached the highest priority to enhance their own salaries and allowances before dealing with issues of higher national priority. They would want to know why they patronise armed wings in their students' organisations in a totally misguided pursuit of the aim of controlling University halls, thus destroying the environment for higher education. They would want to know why their leaders are unable within parliament to adopt a unanimous resolution directing the government and the law-enforcing agencies to take immediate and effective steps to eliminate terrorism. They will want to know why they are unable to call a halt to the confrontational style which results in walkouts, boycotts and entirely unproductive exchanges within Parliament, thus engendering an atmosphere which encourages violence outside, in particular between student supporters of the political parties. People expect the parties to ensure that their leaders are accountable to the party membership and to bodies such as their working committees and their council. We cannot expect parliamentary democracy as provided in the Constitution to work if party leaders seek to concentrate all powers in their own hands, as in the presidential system which the people have rejected, and why they fail to consult their colleagues as well as to respect public opinion at large. There is remarkable national consensus within the country today, popular unity cutting across all parties on the need to end violence to make a mutual effort to create stable conditions in which our children can carry on their educational pursuits and productive activities can be rigorously pursued. It is this consensus and this popular unity which needs to be consolidated so that political parties are compelled by public pressure to give up the politics of confrontation and of patronising those who perpetrate violence in the campuses and elsewhere and instead to work out a national compact on fundamental national issues such as ending violence, establishing the rule of law and respecting human rights and promoting all forms of productive activities. National unity of conscious citizens would enable them to take meaningful action to rescue the country from the sick politics which is threatening our future. An effective strategy must include taking measures to recover illegal arms and steps to de-mobilise the armed cadres of the political parties, neutralising of 'black money' in order to create an environment in which the next election can be a true free and fair election. Thus Bangladesh continues to face the challenge of carrying forward its transition to democracy. The author is senior advocate, Supreme Court.